New York City is defined by its glorious pastiche of cultures, colors and creeds. But inside its public schools, life is far more homogenous, with black and brown students siphoned into under-resourced schools by a persisting color line. But some teachers are challenging the policies that systematically leave disadvantaged kids behind. At a rally on Sunday at New York’s City Hall Park, teachers took the anniversary of the Brown v. Board court decision to call out lawmakers for “failing” students with school reforms that cheat them out of the opportunities they deserve. The rally was part of Save our Schools, a national campaign led by activist teachers, parents and students, to build a more equitable public education system. New York’s branch of the movement has been led by the Movement of Rank-and-File Educators (MORE), a rank-and-file reform caucus in the United Federation of Teachers, together with other education advocates and community and labor organizations. Rosie Frascella, an English teacher at International High School at Prospect Heights in Brooklyn, told The Nation that the constant testing that has become ubiquitous in the city’s public schools—several exams crammed into three days—is driving her students, typically new immigrants who are working hard to learn English, into demoralization and anxiety. The ideological backbone of the high-stakes testing frenzy is a neoliberal school reform agenda backed by Silicon Valley philanthropists and the educational product industry. This marketized educational model that promises to close achievement gaps by managing schools like tech startups, measuring intellect with data and firing teachers deemed underperforming. Yet for all the hype around “innovation” and “standards,” schools remain plagued by racial and economic inequality that speak to the unfulfilled promise of Brown v. Board, sixty years on. Schools serving low-income and segregated neighborhoods have been shown to provide less challenging curricula than schools in more affluent communities that largely serve populations of white and Asian students. The impact of the standards and accountability era has been felt more acutely in minority-segregated schools where a focus on rote skills and memorization, in many instances, takes the place of creative, engaging teaching. Struggling schools with high proportions of low-income students of color suffer from underfunded and dilapidated facilities, along with harsh disciplinary measures under oppressive school security systems. In such a climate of hostility and oppression, there’s hardly any safe space for intellectual exploration or self-expression. The stressful climate and neverending test prep leave teachers scant opportunity for real intellectual nurture, much less the kinds of projects wealthier kids take for granted, like independent research on mathematical patterns in architecture, or a critical dialogue on, say, the legacy of the civil rights movement. Many progressive educators are wary of the boosterism surrounding charter schools, especially because many are geared toward “underperforming” poor Black and Latino communities. These are the schools that tend to be targeted for shutdowns because they are labeled “failing.” They’re also the schools that are being squeezed by the expansion of charters, which are known for hogging scarce facilities and resources in impoverished neighborhoods. Mainstream reform advocates often accuse teacher unions of coddling bad teachers and resisting academic innovation. But at Sunday’s rally, there was little talk of bureaucracy and contract terms. Teachers instead called for a liberation of the curriculum. And this is where the projects of racial integration, academic advancement and labor rights converge. Math teacher José Vilson sees segregation in the city’s public schools as a problem not only of racial disparities, but of a learning environment in which children can’t connect academic concepts to the world they deal with everyday. That hinders them from identifying themselves as intellectual explorers. And these goals demand resources: good wages for teachers, small class sizes, amply funded libraries and a comprehensive staff of school nurses and social workers. At the rally at City Hall, the kids and the teachers were marching in lock step. It was the school system that was out of step—with their communities, and with the mandate of Brown v. Board. 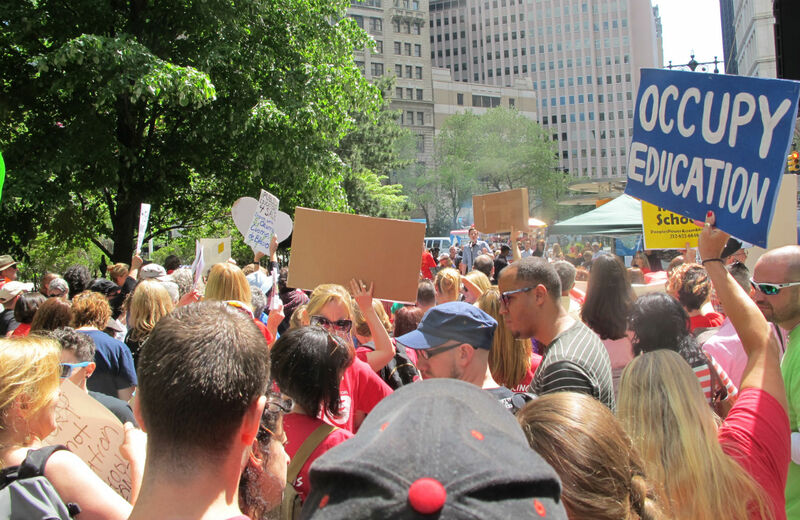 The protesters marched toward the Department of Education headquarters, which were closed that day, so the march did not confront any education officials directly. But for the rank-and-file teachers, it was still a work day.